In November 1732 Lemoyne began to work in earnest on the ceiling decoration of the Salon d'Hercule at Versailles--his first design dates from as early as 1728--and for the next four years he would be engaged upon this monumental mythology depicting Hercules's ascension to Olympus and his marriage to Hebe before the assembled deities of Antiquity. The most ambitious ceiling decoration to be executed in France in the eighteenth century and comprising 142 figures of more than life size, it was unveiled to Louis XV in September 1736 winning for Lemoyne the much-coveted position of Premier Peintre du Roi. Numerous preparatory drawings and pastels for figures in the ceiling are know today, as well as a painted modello for the entire ceiling (Château de Versailles). Furthermore, a painted ebauche in the Kunsthalle, Bremen, depicting the four Muses who accompany Apollo (executed in oils over black chalk on paper) has been attributed to Lemoyne by Jean-Luc Bordeaux (François Lemoyne and His Generation, Paris, 1987, cat. no. 96, fig. 90). Recently, Xavier Salmon (François Lemoyne à Versailles, Paris, 2001, p. 27, fig. 7) has doubted the attribution of the Bremen sketch, which he regards as a copy by an unknown hand of Lemoyne's ceiling group, perhaps based on the artist's modello. 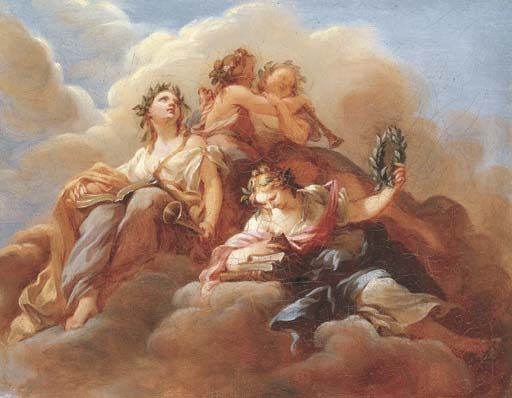 The present lot reproduces the group of Muses as it appears in the Bremen sketch, but with greater finish: here, the Muses are reproduced in their complete celestial setting. Lemoyne, or assistants in his workshop, replicated many of his most popular paintings, and reproduced motifs drawn from his large compositions in small-scale canvases suitable for the picture cabinets of private collectors. Jean-Luc Bordeaux believes that the present lot is a production of Lemoyne's workshop, perhaps made by an assistant as a record of the original disposition of the Muses before Lemoyne altered the group somewhat to the final form that they assume in the ceiling today. We are grateful to Dr. Jean-Luc Bordeaux, who studied a transparency of the present lot, for his assistance in preparing this entry.